Take in the beautiful scenery of Colorado's Front Range, the gateway to Rocky Mountain National Park, as you zip through the trees! Just a 30-minute drive from downtown Denver lie three of Colorado’s longest zipline tracks. 6-line Zipline: Enjoy 4 hours of fresh air, scenic views and thrills on the 6-line zipline in the Rocky Mountains. Ride on six lines that range from 850 feet (259 m) to 1,900 feet (579 m). 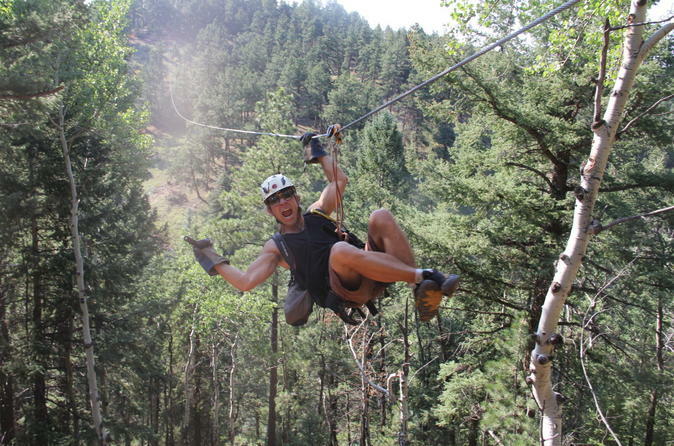 Soar through the treetops and experience three of Colorado’s longest ziplines! There is a 10-minute uphill hike between the first and second zipline and minimal walking between the others; above-average physical condition is recommended.